Mechanical gaming keyboards have soared in popularity, and with a vast number of players looking to secure their slice of this lucrative pie, manufacturers are having to think outside the box in order to stand out from the burgeoning crowd. 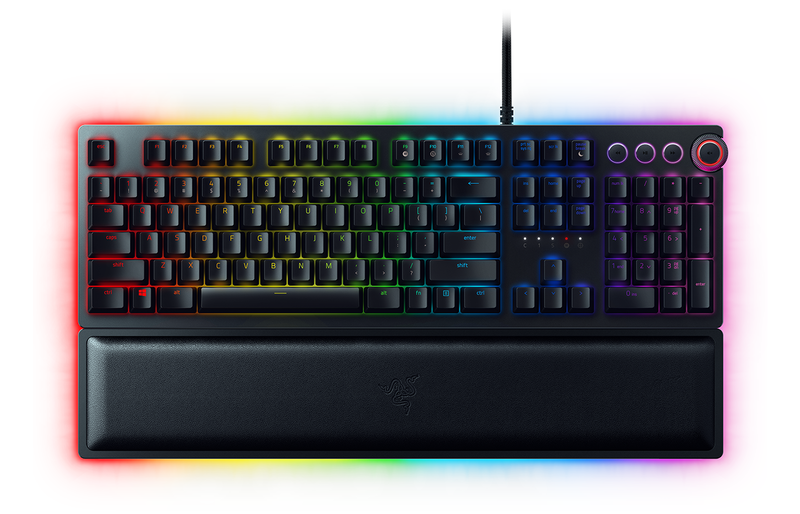 Corsair went all out with the feature-packed K95 RGB Platinum, Tesoro offered a thinner option in the form of the Gram XS, Asus moved the volume roller on the ROG Strix Flare, and Roccat's Horde Aimo attempted to find a middle ground between mechanical and membrane. 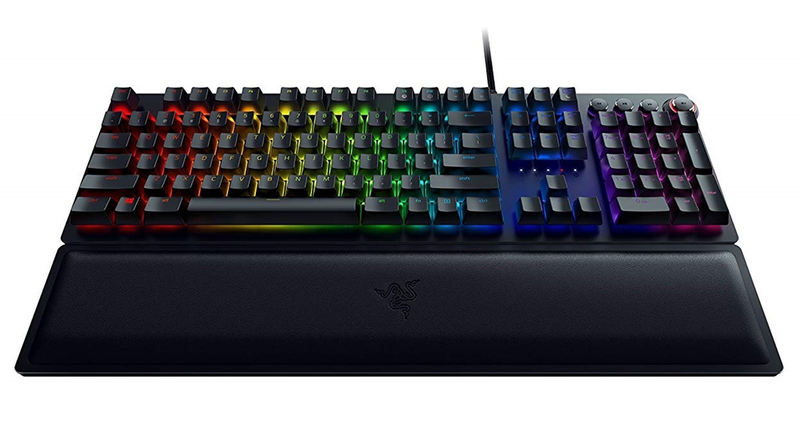 Plenty of variation, and now Razer is hoping to go one better with the Huntsman Elite. Priced at a jaw-dropping £200, the Huntsman Elite is Razer's flagship gaming keyboard and the first to be equipped with the firm's innovative opto-mechanical key switches. Designed to offer "the fastest performance you'll ever experience," the new key switch is the primary justification for the hefty fee, so let's start there. 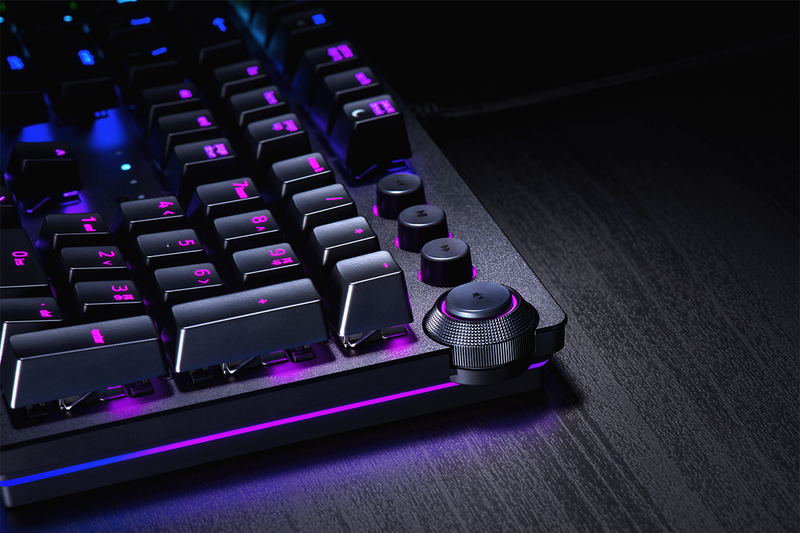 Whereas mechanical keys typically actuate via metallic contact, Razer's opto switch uses a beam of light that, when the key is pressed, passes through the stem to trigger actuation. Total travel distance is measured as 3.5mm, with 45g actuation at 1.5mm, making it an interesting alternative to familiar Cherry M	X Blue. 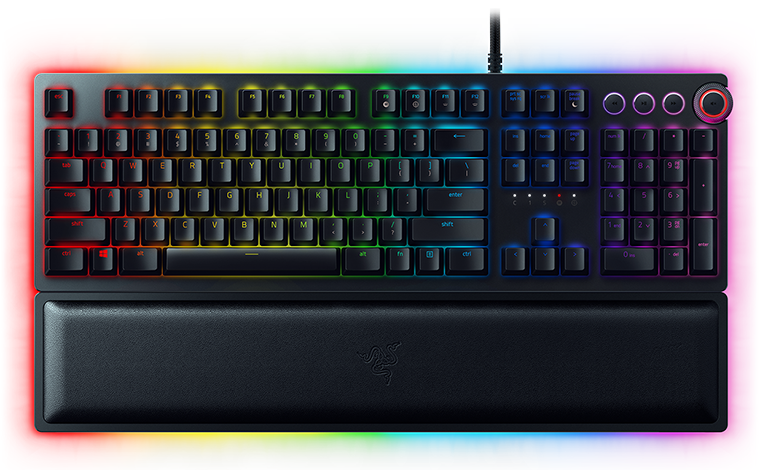 The use of light means the keypress is triggered the moment you feel the click, with zero bounce or reset delay, and Razer's implementation exudes quality. A metal stabiliser bar on the sides of each key, combined with a reworked stem shape, ensures very little wobble among the keycaps, giving an even feel that many competitors lack. 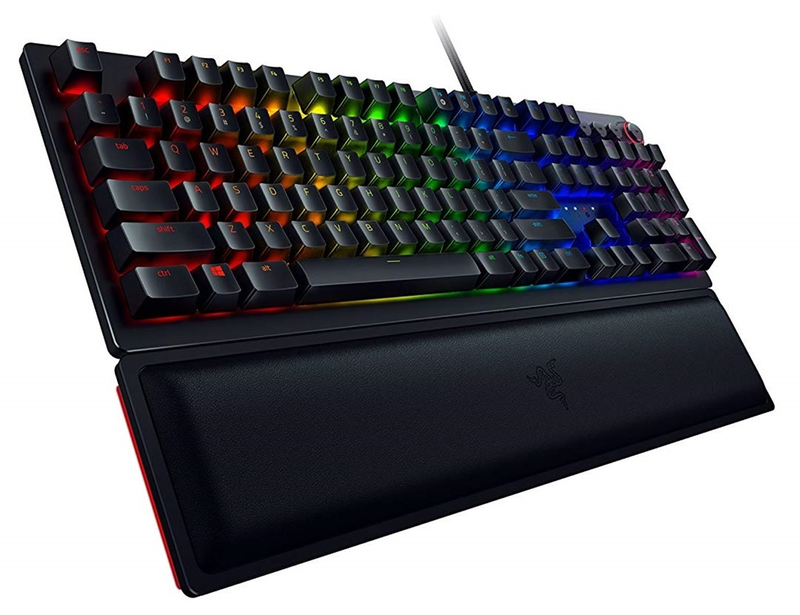 Razer reckons the opto-mechanical mechanism is also its most robust, claiming durability of up to 100 million keystrokes, and if you believe the marketing, Huntsman Elite is said to be 30 per cent faster than a traditional mechanical clicky switch. How does it hold up during real-world use? Well, we're confident in stating that this is one of the best clicky key switches we've used. 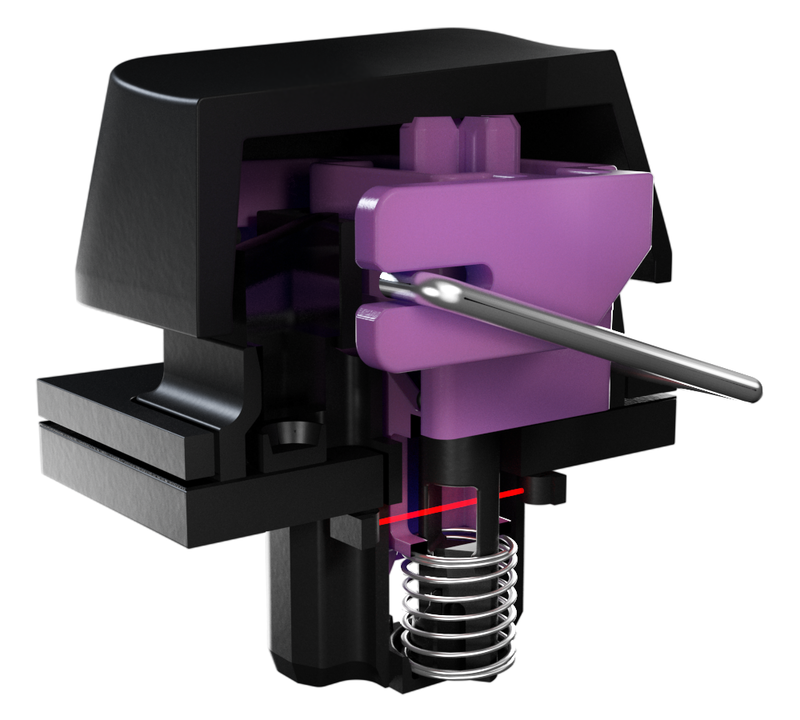 Actuation is wonderfully precise and consistent, the stabilisers do a great job of maintaining balance, and the whole mechanism has a quality feel. The only caveat, in our estimation, is that the switch doesn't feel any quicker during use than, say, a Cherry MX. We're sure somebody in a lab might technically be able to measure a speed improvement, but we're talking fractions of a millisecond, and you'd need Jedi reflexes to notice the difference. The other switch-related caveat is that there's currently no opto-mechanical alternative to the default mechanism. Want the Huntsman Elite with a linear switch or something quieter? You're out of luck, so you'd better be a fan of clicky, noisy switches. I have Cherry MX Blue and Cherry MX Red keyboards at hand, and to my ear the Huntsman Elite is the noisiest of the bunch. While the opto-mechanical switch is admittedly nice, it'll take more than that to justify the £200 price point, and as a complete package the Huntsman Elite has pros and cons. One of the highlights is the magnetic leatherette wrist rest, which feels like a pillow for your arms and attaches to the keyboard via a proprietary pogo pin connection to expand the RGB under glow across both components. We like the fact that the under glow is subtle rather than glaring, and the keyboard as a whole has a likeable appearance, with a stylish all-black aesthetic and an elegant keycap font. Build quality is solid, courtesy of an aluminium top plate, height-adjustable feet and six rubber contact pads, but having used the keyboard for the past week, we've identified a few potential niggles. Firstly, the wrist rest sits proud and doesn't taper down to the desk, which takes some getting used to, and secondly, features such as USB passthrough or dedicated macro keys are conspicuous by their absence. The lack of USB passthrough is confounded by the fact that Huntsman Elite occupies two USB ports on the host PC; one for the keyboard; the other for powering the illuminated wrist rest. Those who have been crying out for dedicated multimedia keys have cause for celebration, as Razer has finally relented. There are now three buttons in the top-right corner - back, play/pause, forward - as well as a clickable multi-function dial. Trouble is, the control is great. The trio of buttons don't have backlit keycaps (they have an outside glow instead) and exhibit hardly any give; whereas the rest of the keys have a good amount travel, these deliver an abrupt click that doesn't feel right. For a keyboard that has one of the best clicky key switches, the multimedia controls are surprisingly unsatisfying, and the dial isn't much better. It is awkward to turn the dial fully as the numpad gets in the way, and you instead have to use the bit that overlaps the right edge of the keyboard for smaller adjustments. Any multimedia controls are better than none, yet we expected Razer to conjure up something more. The good news for readers who aren't feeling the multimedia shortcuts or wrist rest is that a non-elite Huntsman will omit those two features while bringing the price down to a somewhat more palatable £150.